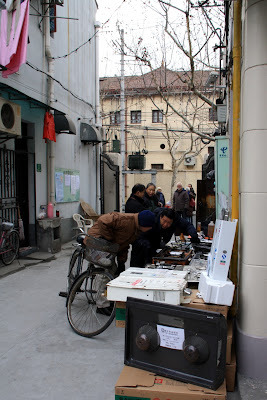 Life on Nanchang Lu: Cooktop anyone? Every now and again some random impromptu shop sets up in my lane. So this morning, directly outside my front door there is now a shop selling gas cooktops and extractor fans. It is attracting quiet a lot of attention as you can see, but it must be semi-official because the lane is normally policed by a small woman wielding a broom, and she seems unperturbed. Perhaps chinese cooking puts such a toll on your gas burners you need to purchase new ones each year. Or perhaps some people are as excited by extractor fans as I am by shoes. I guess that is possible.